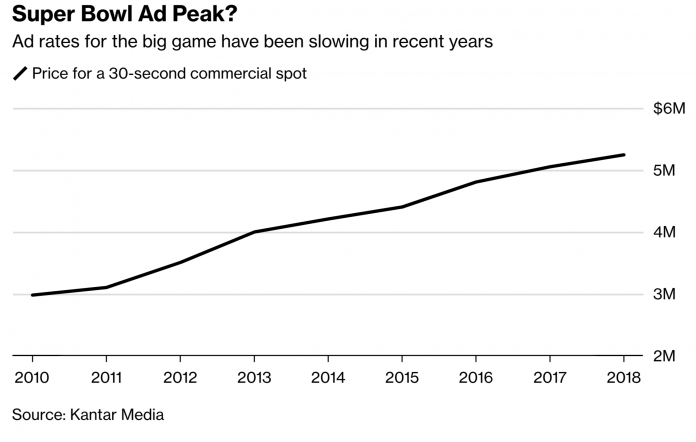 Without doubt, the ad slots sold in 30 second slices during the Super Bowl, are the most expensive anywhere in the world. This year, a 30 second slow will be sold for an average price of $5.1 to $5.3 million. We do suspect that there is a discount for advertisers who run 60 second ads, but not by much. This however does represent a slower growth rate than previous years. Last year’s prices averaged over $5.24M and that falls right in between 5.1 and 5.3. Sort of. In the mean time, we’re dealing with a shrinking audience. The audience numbers peaked in 2015 at around 111M viewers and has been falling. Last year’s broadcast was viewed by around 103M viewers. In our opinion, the quality, entertainment value and over all virality of the ads has dropped considerably. We still remember some of the ads from the last decade, but would be hard pressed to recall some of last years.